In the middle of the zone is a large body of water. These are found just northeast of that body of water. This page last modified 2018-08-13 23:09:23. Confirming that the camp is down the hill from Lupot… I sat at p740, p660... it is the 3 lotus mobs. They are on a 20 minute timer. Many times after I cleared all 3 mobs, 5 minutes later a Shuddering Fungus spawned at the middle ph... but not always. He also spawned on a small hill within striking distance at p670, p675 on occasion. I went through about a dozen Shuddering Fungus without getting the epic 1.5 drop. Then on one occasion, 2 Shuddering Fungus spawned at the same time... they both had my drop. I was at this camp for a total of about 6 hours on and off over a few days. Ok Kill the Lotus Blossoms and the mushroom to the NW of Lupot. I had two spawn back to back by doing this...I had killed all other mobs but these and these are spawn points as well. When you say Lotus Blossoms, do you mean a deep cavern lotus? What is the exact name of the ph's you are killing NW of Lupot? Ok, let's correct some stuff to kill the confusion, since apparently I'm not the only one that was confused(two other shamans were doing the same thing that I was). First off, if you're trying to find the placeholders: they're directly next to Lupot. There are 3 of them right over the hill. They're also next to 2 deep cavern lotus. Kill all 5 of those mobs, the lotus will attack you anyways. Shuddering Fungus will eventually pop. I got 3 to pop in 4 rounds and 2 Bleak Fungus dropped. They are not, as other comments imply, the bent over small mushrooms in the camps of the mushrooms(in the surrounding area of Lupot) that look like they're dead. I spent 10-12 hours killing those and never got a single named to pop. I went 4 rounds with 3 pops and both drops killing the mushrooms next to Lupot, so it's definitely not the 'bent over' small mushrooms. Don't waste time killing them: you will think something is broken. Glad I found that out, since now I can let everyone know: the information on here will lead you to the wrong place. Ok so the locations above aren't the right locations for the placeholders? Just had 2 of these named spawn right next to each other. You only need to kill the 3 mushrooms near Lupot. no need in killing all the mushrooms in the whole zone. There are three single mushroom spawns next to Lupot Nukla. Clear all three spawns, because the Shuddering Fungus can spawn at any of the three locations. Common spawn place holder is "a small mushroom". I would guess the Shuddering Fungus appears in about 1 in 10 common spawns. The middle mushroom spawn time is just a bit longer than 11 minutes. The two side mushrooms spawn time is just a bit longer than 24 minutes. 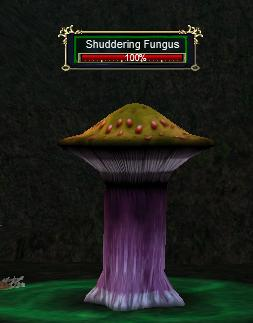 The Bleak Fungus drop is an uncommon drop from Shuddering Fungus and would guess it drops about 1 in 5. So expect to camp there for hours+. has sony nerfed this mob im here and there is no insta spawns been here for about 2 hours and only seen him once ? Agree! Sure as hell not a 14 or 30 minute timer. Stupid that you need to rather rare drops and no re-spawns. Sony just baffles me sometimes. Just did this today on Bristlebane. Locs currently listed in the Monster description of this page are incorrect. Confirmed loc of the primary spawn point is 732.00, 622.00. This mob on a 14 minute timer. Two other placeholders do spawn on either side of the primary but were on a timer of roughly 30 mins for me. Past these into your map for easy location. The twinkling shrubs are ground spawns in Twilight Sea. Has nothing to do with the Shuddering Fungus in Fungus Grove. Please relocate this info and remove the locs posted on this page's header. Finished my 1.5 and I see a lot of people getting bugged at or near this point. Once you have looted 2x Bleak fungus, you MUST, no acceptions, do not forget to Hail Lupot Nukla. You still must talk to her before handing in the combine. I can confirm this to be accurate as of today. Look in the 2 caps nearest the frog, you'll see 2 mushrooms (one in each) that looks dead - these two trigger the named one. They seem to alternate in each camp and, while not instant spawn, they do respawn quite fast. 67 Shaman with Journeyman I tank merc. Just did it right now. Took me 5 kills. One was up right west of the frog shaman when I got there, killed it and it dropped my first bleak fungus. I hailed the froggy but no more would spawn, so I just cleared the small camp right southwest of the froggy. There was a single mushroom spawn where it spawned small mushrooms instantly. I kept killing the smaller mushrooms that spawned and shuddering ones spawned randomly from it. Got my second fungus on the 4th spawn from the insta-spawn point. (5th kill total). Took me around 10 minutes since getting to the npc. Very quick. Five spawns of the shuddering through probably 8 total spawns (instant re-spawn) and got my two drops. The other 2 seemed to spawn where the small mushrooms we killed were standing. Got first one of the two right away as I got there, still camping second one. Taken it down 3 times and no bleak so far. Spawns about every 3rd I'd say. Hits for almost 500, pretty fast even when slowed. Casts alot of Mort Drowsy and something that transforms you into a mushroom, rooting you and doing 200dd in the process. Didnt resist much, doesnt have too much hp. Edit: Ok I think it's Shrieker's Curse that it casts. Find Lupot Nukla in FG (loc 660, 520). Talk to him according to spoiler, although not sure it makes any diff. From Lupot, look down the west side of the hill he stands on. You will see a lotus at the base of the hill on left and right side, a small fungus between them, and maybe one fungus on right side by the wall behind the right lotus (a few feet further west of it). Now, pull the center fungus up top and kill it. It respawns immediately. This is a PH for the Shuddering. The one behind the right lotus is too. So there are two spots he can spawn. Just keep killing both. At level 66 the other mobs there were light blue and did not assist, so it was easy to single pull the PH or Shuddering up top of the hill. Pull it all the way up, because when low on health it will run. It cannot be snared or rooted. If you pull it high up it will path away from the other mobs, i.e. south. Boxed this wil 66 shaman and monk, and didn't have to heal at all. Very easy. So I was just doing a little exploring of this zone after helping a high elf kill 80 small mushrooms for her cultural tradeskill task. I came upon these guys (2 of them, 1 small mushroom, and 2 lotus). Kill the lotuses and then killed one of the shuddering. Then I killed the small mushroom and another insta-popped where it had been. Killed it again, same thing. Then I decide to kill the other shuddering, then come back to the small one. When the small one died this time a shuddering spawned in its place. Killed that... another shuddering. At this point I was a little low on mana and decided "***** it, I'm out". Did get a bleak fungus not knowing what it was for, so I don't think they're THAT rare of a drop. If the Bleak Fungus drop is rare, as I recently read, then we must have been lucky... We were finishing the Beastlord epic (70 shm, 66 cleric, 62 ranger, 59 bst, 53 bst) when we noticed this large mushroom. We decided to take it down. Went very fast. Summons, casts some slow type things, but nothing too bad. Dropped the Bleak Fungus. Then we killed the one or two little adds, only to turn around and find that it had spawned again, within about 30 seconds. So we took it down again, and it dropped another one. Just as I was about to campa dn run my shaman over to get the drop as well, we noticed that this damn thing had spawned AGAIN! So we killed it again, and this time it dropped the sturdy mushroom stem, whatever that is for. At that point we got tired of it and left... it immediately respawned again though, so I can only conclude that this mob is always up. Thanks bud, this is exactly the information I as looking for! Max hit on me was 491. Average was under 200. Resisted Mort Drowsy with 130ish DR all 9 times in the 1-2 minute fight. Seemed to be a proc. Didn't have very many hitpoints. Probably not even twice what the small mushrooms have. I ran across this guy yesterday while scouring thru this zone. If you come in from the Echo side , this fungi is a ways north ,near the entrance to the shik nar tunnels. He is to the right of the entrance , up against a wall, situated in between two lotus plants (perma rooted) and not too far from a mushroom camp. A few things to note. You can agro the lotus from a distance , but they are permarooted. If you approach one to kill it, you will agro the Shuddering Fungus. So unless your able to kill at least one of these from afar , expect one, if not both lotus' to cast on you during your fight with Shuddering. Also , try not to back up while fighting him. Your near a mushroom camp, and they will add. The Shuddering himself is an easy fight . I solo'd him as a lvl 70 paladin , but the adds almost killed me. He dropped A Sturdy Mushroom Stem when i killed him. Good info there Bane. Just a heads up for hassle free killing of this critter. There's a ledge looking down on his spawn point you can pull him to. You'll know the spot by finding Lupot Nukla, a froglok NPC found at +638.62, +520.47, -219.72. Lupot was non-aggro and indiff to me as a 65 Vah Shir Beast--no idea as to what factions he's on so YMMV--and I just sidled down a bit, made sure to look out for the lotus Bane mentioned above, and got within cast range. He does summon on damage spells, but with beast slow, he came right up to me instead. Keep him on the ledge and don't back into the Lotus agro range and you'll be fine. Note, my experience is based on 65 Beastlord, not sure how other classes will fare. Also, for some reason, shrooms are single pullable at 60. Dunno why that's a magic number, but at 60 I spent a bit of time AA'ing at the shroom camp near the outpost and could single the shrooms that were practically touching--with DDs, DoTs, or Slow, didnt' matter. However, they have an interesting agro proximity radius. That said, at level 60 or higher, the shrooms around Shuddering *shouldn't* add when you pull him with a spell like slow--they certainly don't at 65. Good hunting to all and much luck to Shaman working on their 2.0s.